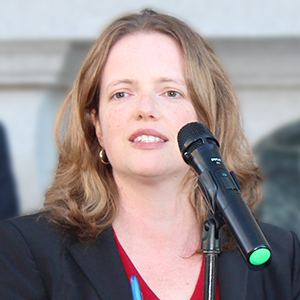 Deputy City Attorney Tara Steeley argued in April that California courts have jurisdiction to hear consumer protection cases like the one City Attorney Dennis Herrera filed against Monster Energy—and that Monster’s pre-emptive suit to block Herrera was properly dismissed by a federal court. The Ninth Circuit U.S. Court of Appeals agreed, upholding the dismissal on May 17, 2016. SAN FRANCISCO (May 18, 2017)—A three-judge panel of the Ninth Circuit U.S. Court of Appeals has upheld a lower court decision to dismiss Monster’s Beverages Corp.’s lawsuit against San Francisco City Attorney Dennis Herrera, dealing yet another setback to the energy drink manufacturer’s bid to block Herrera from moving forward with his consumer protection case in state court. The May 17 decision agreed with arguments made by Deputy City Attorney Tara Steeley at a hearing in April that California courts have jurisdiction to hear such cases, and that the U.S. District Court properly dismissed Monster’s federal suit. Monster, the nation’s largest energy drink manufacturer, pre-emptively sued Herrera after learning of the city attorney’s investigation into the company’s alleged violations of California law. Monster’s still-dismissed federal action is: Monster Beverage Corporation v. Dennis Herrera, U.S. Court of Appeals for the Ninth Circuit, 13-57128 (originally filed in U.S. District Court, Central District of California, Eastern Division, CV‐13‐00786, on April 29, 2013). Herrera’s state lawsuit is: People of the State of California v. Monster Beverage Corporation, San Francisco Superior Court No. CGC‐13‐531161, filed May 6, 2013.